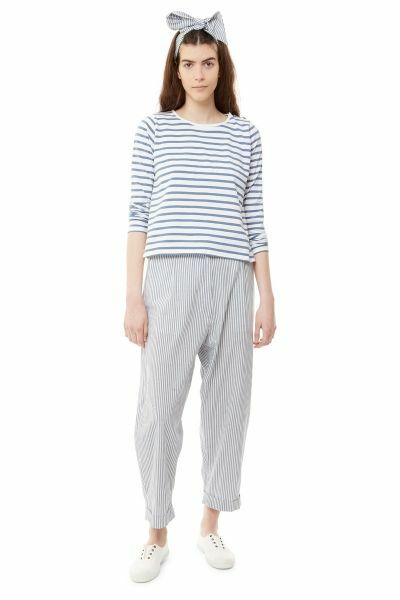 Our version of the classic striped t shirt, in an already faded blue stripe and made from a delicious dry cotton jersey. A perfect every day top in a slightly A-line shape but with fitted shoulders which are buttoned on one side. The long sleeves and round neckline make this a must have piece to wear with skirts and trousers alike. The Tara Top in faded blue & white stripe jersey is a simple A-line staple. Fitted from the bust and flaring out into the most flattering style. 3 Cabbages & Roses engraved buttons fasten along the left shoulder. Neat fitted shoulders lead into extra long sleeves that can be scrunched up for a relaxed look. Tara is a pull on style that falls to just above hip length. Wear her with any of our trousers for an easy summer look. The Tara Top has been cut from crisp faded blue & white stripe cotton jersey woven in China. Tara was made in China. 100% Cotton.